Do You Have Circuit Boards or Computer Components You Can Sell? You can find a great deal of satisfaction by going green and selling your circuit boards or computer components to a recycling company. You can also make some extra money by choosing to take on this type of endeavor. You can also receive money for scrap aluminum at the same place you sell recycled computer parts. Usually, the components you sell are purchased on a per pound basis and you can obtain the information online about pricing. As a seller though, you are typically responsible for the shipping costs. While the recycling of electronics may not have occurred to you before, you can make substantial change when you sell what is also known as eWaste. The term eWaste is another name for electronic waste. Because people constantly are buying new electronics, you have a pretty viable market. Therefore, you can begin this type of venture by asking friends and family if they have electronics they no longer use sitting around their house. Most people will be joyous about the fact that you are taking a clunky old monitor or desktop computer off their hands. Besides individuals, you can also ask companies, universities, or schools for old computer equipment – items that are no longer wanted or used. When you think about the potential money you can make by taking on this initiative, you will want to start making phone calls right away. While a motherboard, computer case, or computer chips can be sold online on such sites as Craigslist or EBay, you can sell the other parts—such as the metal and plastic—to recycler. Again, you are normally paid by the pound for the components and materials. Once you start collecting eWaste, you will find that certain parts are more valuable than others. Anything that is made of such metals as gold, platinum, or silver will fetch a higher price. For example, you can detach solid gold or gold-plated connector pins from components and sell them to a metals refiner for processing. Besides asking your friends and families about their stash of old electronics, you can also use the follow methods for obtaining the materials. Naturally, any free offer will get people to act. Therefore, you can advertise your hauling service on Craigslist or through advertisements in free local classifieds. You can also garner a response by leaving flyers at people’s doors or at yard sales. If you do charge a fee to haul off the eWaste, it is better to offer this service to businesses. Because the electronics at a business are normally more voluminous, a company is usually more than happy to pay you to haul off and recycle its junk. You can also gather old electronics by hosting a recycling drive. Advertise on Craigslist or alert the public through your local media. You can also announce the drive on social media. While this type of business can start off small, you might be surprised. You might turn it into a full-time enterprise! https://www.cjdecycling.com/wp-content/uploads/2017/09/image1-17.jpeg 664 1000 CJD E-Cycling http://www.cjdecycling.com/wp-content/uploads/2013/04/banner.jpg CJD E-Cycling2017-09-22 14:06:422017-11-28 14:12:18Do You Have Circuit Boards or Computer Components You Can Sell? If you lack adequate equipment and experience, file cabinet removal and recycling efforts can be challenging. Luckily, CJD E-Cycling has comprehensive filing cabinets recycling services that make this process easy. We can come to your location and take away all of your unwanted file cabinets with dollies. We can even use fridge dollies to haul off your cabinets if your building lacks elevators or stairs. Before offering our filing cabinets recycling services we will check your cabinets to determine whether or not they are fit for donation. It is important to note that many filing cabinets are not suitable for donation given that non-profit organizations have received an overwhelming supply of these products due to the economic downtown. These resources are fast-becoming obsolete now that more and more companies are opting to go paperless and are storing their important documents in digital format. Moreover, there isn’t a robust resale market for file cabinets due to these same reasons. File cabinets recycling is a simple and straightforward process given that these cabinets are often comprised entirely of metal. Heavy equipment is used to complete the prepping process. This equipment tears, smashes and bails each unit. The resulting materials are then sent to smelters so that they can be melted down into their raw form. These raw materials can then be reused. There are a number of creative ways that businesses can reuse their filing cabinets after having fully transitioned to wholly paperless operations. These strategies work best in homes and in small-sized offices where only a small number of filing cabinets must be repurposed. Not only are they great for transitioning obsolete resources into something functional and fun, but they will also help environmentally-conscious businesses and consumers limit their contribution to local landfills. Place your filing cabinet on its back and remove the storage drawers. You can fill the empty chambers with mops, brooms, shovels and other tools or you can use them for blueprint and architectural drawing storage. 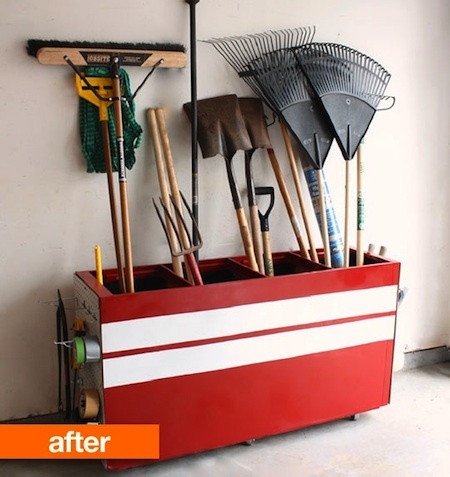 These new storage systems can be enhanced with an attractive coat of paint or accessorized with a pegboard, whiteboard or other functional addition. Position a mini file cabinet beneath the surface of a rolling cart. Fill the drawers with all of the tools that you need to mix up your favorite cocktails. You can accessorize your rolling cart with a utensil hook or a wine rack, temporary wallpaper or paint. Add an attractive slab of wood to the top of a rolling filing cabinet in order to create your own, mobile kitchen island. You can affix a paper towel holder or a utensil rack to the side of your island. This can be painted in any color of your choosing. Two, miniature filing cabinets can serve as the perfect base for a new desk. If you have an unused door lying around, this will make the ideal desktop. You can experiment with different paint colors for both the file cabinets and door and will find that this design provides sufficient space for multiple computer monitors and numerous desk accessories. Rather than tossing an old filing cabinet drawer out, consider using it as a book holder. These also make great planters. You can even use the actual cabinet structures as garden planter boxes. If you have more filing cabinets than you can possibly repurpose, contact CJD E-Cycling at 618-659-9006 so that we can remove these fully recyclable items from your place of business. Ferrous metals take their name from Latin. In ancient Latin, Ferum translated as iron, thus ferrous metals all contain iron. The unique qualities between the different ferrous metals result from changes in the atomic relationship. 5257 N. St. Rt. 157.